This page gives a list of the trees that have been planted in the orchard. There is a wide variety of trees in the orchard, including apples, pears, gages, cherries, a mulberry, a quince and a medlar. In the lists below, the tree type is apple unless otherwise stated. Please note For most of the trees listed, extra information can be found by clicking on the + symbol by the name. This tree has a distinctive weeping habit. The apples are rich and sweet. Medium flushed orange. Slightly acidic. A slow growing tree. The apples keep for a long time and develop a complex spice-like flavour. Medium russet.Slightly acidic. The ribbed, almost oblong apples are green with brown/orange flush. They are crisp and firm when picked and become less sharp with storage. Medium green flushed brown. Slightly acidic. A neat, compact, upright tree. The pears are small, sweet and melt in the mouth. The name comes from five ribs at the base of the apple. Crunchy yellow flesh that holds shape when cooked. Medium green flushed red. Acidic. A greenish yellow skinned gage that is probably a seedling of Green Gage. A more prolific cropper than Green Gage. Sweet, soft, juicy flesh. Medium green. Sweet. Raised at Willingham as a seedling of a Green Gage. Selected by the RHS for its good cropping and excellent fruit quality. Large green. Sweet. Known in Norfolk for centuries but may have originated in France or Holland. Excellent for making dried apple rings, for baking and for cider making. Medium flushed red. Slightly acidic. The name is derived from the Cistercian Abbey at Warden, where the fruit may have originated, possibly as early as the 1300s. The flesh is coarse and firm. Excellent for bottling and roasting. Large green flushed brown. Sweet. Raised by Stephen Chivers of Histon. Sweet crisp, flavour. A good garden apple. Medium large flushed green red. Sweet. Our youngest variety – a ‘sport’ of the New Zealand apple Gala, which was found growing in orchards at Earl Stonham. Now enjoying some commercial success locally. Medium flushed pink. Sweet. This apple was sold at the Wisbech fruit markets in the 1920s and 30s. The crisp and juicy apple doesn’t keep – eat within a week of picking! Medium flushed red. Sweet. Raised by John Chivers of Histon. The apple has a sharp and crisp flavour when picked, mellowing with storage. Good for cooking too. Medium large yellow. Slightly acidic. The Beaujolais Nouveau of apples – an early variety grown commercially in the UK. Lacks flavour if picked too early so leave until the apples have developed a red skin. Medium large flushed red. Sweet. An apple from Peckover House gardens in Wisbech. The skin has a peach-like white bloom. A very early dessert variety, best eaten in August. Medium large flushed pink. Sweet. Raised by Miss Cunningham of ‘Wayside’, Huntington Road, Cambridge. The apple has distinctive fruity-tasting crisp flesh. Medium large reinette. Sweet. Once popular in the Cottenham area, this tree is possiibly named after the village Public House where fruit was once traded. A lost apple that was rediscovered in 2005. Medium yellow flushed red. Slightly acidic. Raised by Robert Norman of Cottenham. A long keeping cooking apple once popular with gardeners and commercial growers around Cambridge. Cooks to a bright lemon puree with excellent flavour. Medium yellow flushed red. Slightly acidic. Once popular in the Cottenham and Histon areas. The apples hold their shape well when cooked and need almost no sugar. Large green. Slightly acidic. Raised by William Pleasance in the Barnwell area of Cambridge. A spice-like flavour coupled with excellent keeping qualities. Medium reinette. Sweet. Exact place of origin unknown, but has been grown in Norfolk for centuries. Once a common sight on local markets. A small red flushed sweet pear best eaten very soon after picking. Raised by a Mr Hacon in the early 1800’s. Produces crops of green good looking pears which have a sweet and delicious flavour when cooked. Known around Colchester but exact place of origin not known. A medium-sized, russet pear. A heavy cropper best eaten near Christmas. Raised by nurseryman Jervaise Coe of Bury. It is a large amber coloured fruit distinctively spotted with red flecks. A heavy cropper, very sweet and juicy and considered by many as the best flavoured of all plums. Medium large, round-oval fruit with dark red skin which is usually covered with a heavy purple bloom and tiny primrose dots. The sweet, juicy flesh has a pleasant flavour. It can be eaten as a dessert variety but better suited to culinary use. Summer Sun is a modern English dark red cherry variety with firm crisp flesh and a good flavour. It is one of the best cherry varieties for the UK, being a reliable cropper with good frost tolerance. It is particularly suitable for colder more exposed locations. Colney is a new large English dark red/black dessert cherry, with a good cherry flavour. It is later ripening than other varieties. A large black skinned variety with very dark red flesh and good flavour. It is heavy cropping and fruits early. Descended from a tree that was growing in the 1660s in the gardens of Woolsthorpe Manor, near Colsterworth – the home of Sir Isaac Newton. A large ribbed and irregularly shaped orange-red flushed apple, with a few broken red stripes. It cooks to a mildly acidic puree. Found growing as a seedling tree at Burghley House. Rescued by the Head Gardener and first sold by a Peterborough nurseryman. It became a popular gardeners’ choice and received an RHS award in 1865 for its long keeping qualities. Sweet tasting, it will keep until April. A long keeping green skinned variety. Course fleshed so keeps shape quite well when cooked and needing little sugar. An early dessert apple bred at Papworth Everard Hall by crossing Margil and Cox’s Orange Pippin. Small to medium in size. Distinctly flushed dark red with an aromatic taste. Discovered growing at Willingham by nurseryman Mr. Ralph Thoday. it is probably a seedling of the dessert variety Devonshire Quarrenden. Small sized with a bright red skin. It will keep until February. Came first in the ‘Orchard Tree Vote’ held at Histon and Impington Feast Market, 2013. A very attractive tree, slow growing but long-lived and capable of growing to quite a large size. The dark red, almost black, fruit are similar to blackberries in appearance but are very juicy with an exquisite intense sweet sharp flavour. Raised by Laxton Brothers, the famous Victorian plant breeders from Bedford. It is a cross between Cox’s Orange Pippin and Wealthy. The skin is pale yellow, mottled with orange and red. The flesh is sweet and firm. Meeches Prolific is one of the most popular quince varieties grown in the UK. Unlike many it gives a good crop in the British climate. It produces attractive large slightly pink blossom. The fruit is quite large and pear shaped. It ripens in October turning a golden yellow colour and developing a strong quince aroma. Excellent for making quince jelly. Introduced by nurserymen Wood and Ingram of Huntingdon. The skin is pale yellow with a few red stripes. The soft and juicy cream coloured flesh is not very acidic and will cook to a frothy puree. This produces medlars that are about 7cm across. The fruit, which is rich in vitamin C has a delicious, acidic flavour which should be given time to ripen before eating. A large green gage with sweet fruit. Came second in the ‘Orchard Tree Vote’ held at Histon and Impington Feast Market, 2013. A greenish yellow skinned gage that is probably a seedling of Green Gage. A more prolific cropper than Green Gage. Sweet, soft, juicy flesh, excellent for jam making. A small black skinned sweet cherry local to the village of Polstead near Hadleigh. Recorded as being sold on Sudbury market in the 1940s. Distinctively red fleshed and very juicy. Came third in the ‘Orchard Tree Vote’ held at Histon and Impington Feast Market, 2013. Grown commercially in the Chivers orchards. Very large fruits. A good apple for baking or juicing. Grown commercially in the Chivers orchards. A small, red, sweet apple still widely grown commercially today. Grown commercially in the Chivers orchards. Apples cook to a stiff puree, but also good for eating. Grown commercially in the Chivers orchards. An early apple flavoured with a hint of strawberry. Grown commercially in the Chivers orchards. The classic english cooking apple, also good for juicing and cider. Grown commercially in the Chivers orchards. A sweet apple, whose flavour develops if the fruit is left on the trees. Grown commercially in the Chivers orchards. Very large apple – good for juicing and cider. Histon and Impington Climate Change Action, (HICCA) is a group of local people from in and around the villages of Histon and Impington, who have got together to take action on the problem of manmade climate change. 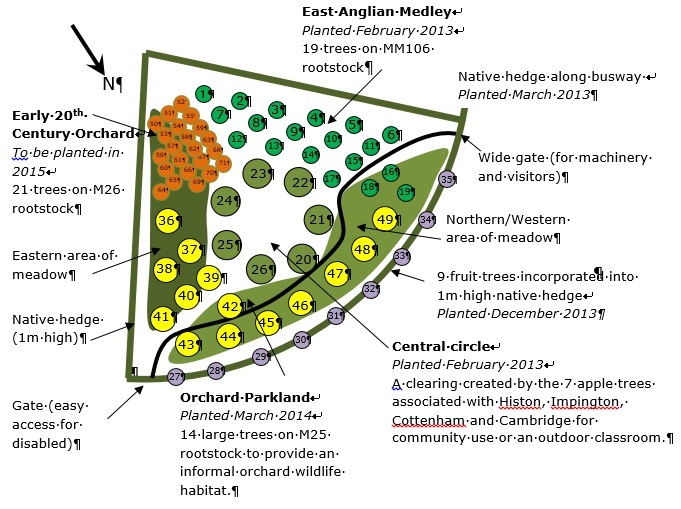 The East of England Apples and Orchards Project is a registered charity working to guarantee a future for local orchard fruits and orchards. As well as running workshops and selling fruit trees they have a wealth of knowledge about orchards. Transition Cambridge aims to help Cambridge make the transition to ways of life that are less reliant on oil and other fossil fuels, and are more resilient in the face of shocks such as spikes in oil prices and extreme weather events caused by climate change.